LSST’s mission is to build a well-understood system that provides a vast astronomical dataset for unprecedented discovery of the deep and dynamic universe. 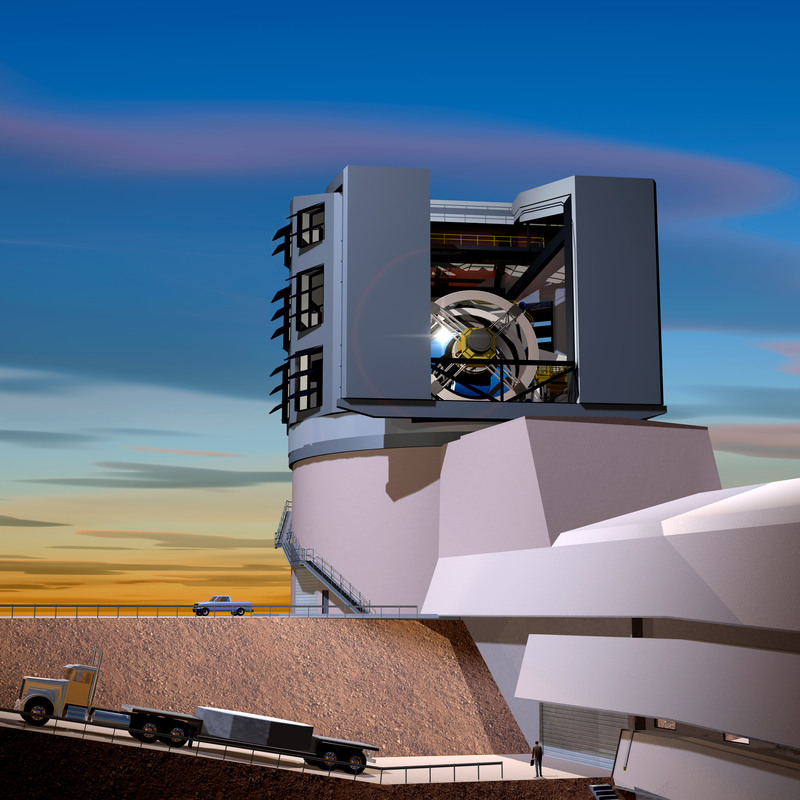 In this artist’s rendition, the LSST primary mirror is seen through the slit of the dome at sunset. The scientific questions that LSST will address are profound, and yet the concept behind the design of the LSST project is remarkably simple: conduct a deep survey over an enormous area of sky; do it with a frequency that enables images of every part of the visible sky to be obtained every few nights; and continue in this mode for ten years to achieve astronomical catalogs thousands of times larger than have ever previously been compiled. The construction phase of the project will deliver the facilities needed to conduct the survey: a large-aperture, wide-field, optical imaging telescope, a giga-pixel camera, and a data management system. The 8.4-meter LSST uses a special three-mirror design, creating an exceptionally wide field of view, and has the ability to survey the entire sky in only three nights. The LSST Summit Facility is located on the Cerro Pachón ridge in north-central Chile. The telescope site is inland and approximately 60 m (100 km) by road from the support town of La Serena, where the LSST Base Facility is located. The LSST camera must produce data of extremely high quality with minimal downtime and maintenance. In order to take advantage of high-quality images produced over such a wide field, the camera contains over three billion pixels of solid state detectors. Software is one of the most challenging aspects of LSST, as more than 30 terabytes of data must be processed and stored each night in producing the largest non-proprietary data set in the world. Everyone can share in the excitement and discoveries of LSST with planned activities for education and public outreach.